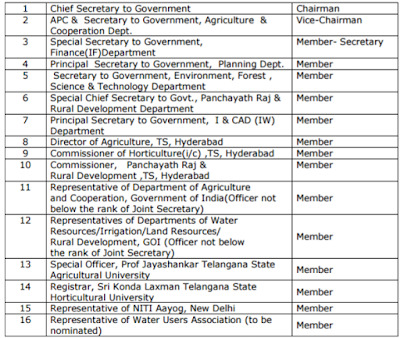 Telangana Agriculture & Cooperation Department - Pradhan Mantri Krishi Sinchayee Yojana (PMKSY) - Constitution of State Level Sanction Committee in Telangana State – Orders-Issued. 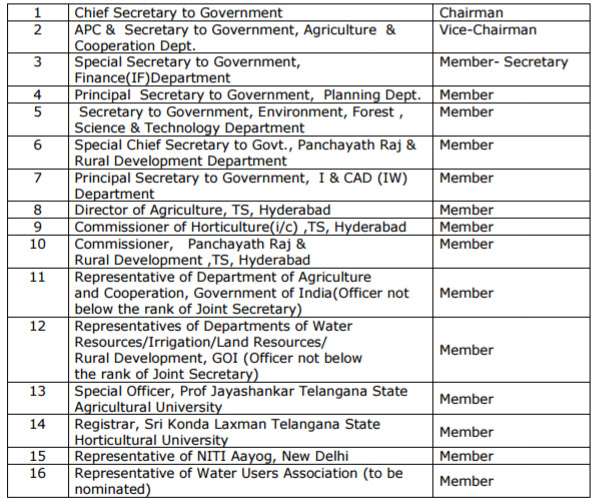 From the Director of Agriculture, TS, Hyderabad Lr.No. NRM/ 10/ 2015, Dated 14-12-2015. 2. Sanctioning and prioritizing funding of projects under PMKSY. 3. Monitoring and reviewing implementation of PMKSY. 4. Ensuring convergence with other schemes and that no duplication of efforts or resources takes place. 5. Ensuring that there are no inter district disparities with respect to the financial patterns/subsidy assistance in the projects. 6. Deciding the implementing agency/dept. in the State for particular project depending on the nature of the project and expertise available with the agency/dept. 7. Ensuring that the programme implementation in accordance with guidelines laid down by the concerned programme component Ministry/Department. 8. Initiating evaluation studies from time to time, as may be required. 9. Ensuring that all extant procedures and instructions of Govt. of India are followed so that the expenditure incurred on implementation of the projects is barest minimum with due concern for economy in expenditure and also in conformity with the cannons of financial propriety, transparency and probity. 10.Ensuring that Panchayat Raj Institutions (PRI) are actively involved in implementation of PMKSY, especially in selection of beneficiaries, conducting social audit etc. 3. The Director of Agriculture, Telangana, Hyderabad, shall take further necessary action accordingly.